Panasonic has released a staggering 16 Micro 4/3 cameras in the past five years. Some have been truly stellar, others mere refreshes or dumbing down of previous cameras. When Panasonic’s first rangefinder styled camera, the GF1, was released, people flocked to it. It’s small form factor, simple lines, responsiveness and level of control were outstanding. Panasonic then decided to take the GF line towards the consumer end, and the following GF cameras were generally downgrades from the GF1. 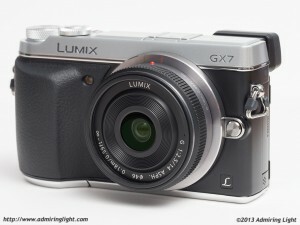 Not until 2011’s GX1 (reviewed here) did Panasonic finally create a worthy successor to the GF1. Now the GX line, which is Panasonic’s high-end rangefinder styled line, gains a new member – the GX7. However, instead of working on incremental upgrades to the GX1, Panasonic essentially grabbed every desirable feature from other Panasonic cameras and from around the mirrorless world, and shoved them all into a single body. 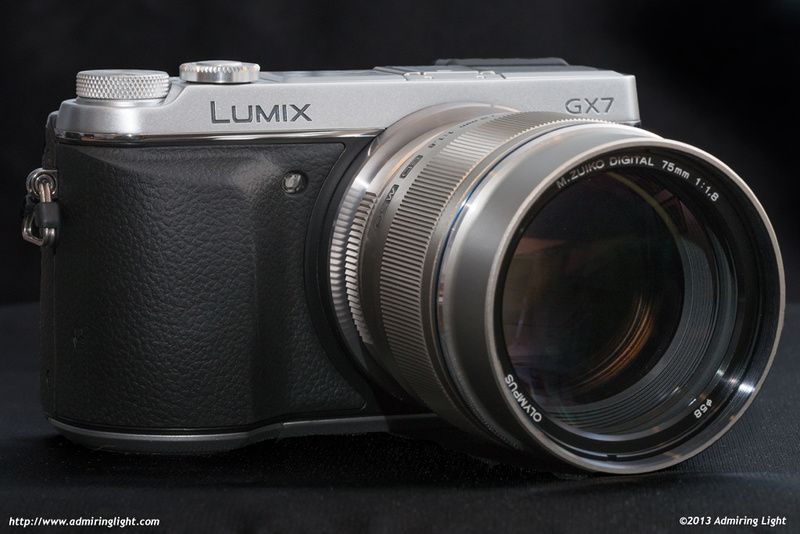 The GX7 in many ways is a sort of ‘second flagship’ camera for Panasonic, which, along with the GH3 (reviewed here), is designed for enthusiasts and professionals who want a highly capable body in a small package. 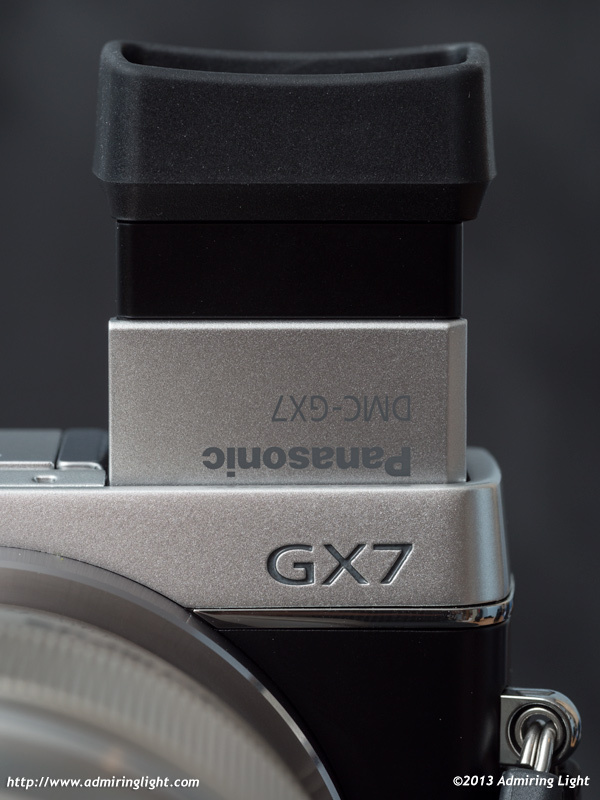 Because the GX7 has a more rangefinder styled body, Panasonic included it in the now two member deep GX line. However, the camera feels in the hand much more like a G6 that has been made smaller than a GX1 that has gained new features and a viewfinder. Indeed, it is notably larger than the GX1 that came before it, though not excessively so. The camera has a thick sculpted rubber hand grip to go along with the sleek, almost-but-not-quite retro body design. The grip feels fantastic in the hand. It’s not too thick as to make the camera bulky, but it provides enough grip to handle well with even the largest Micro 4/3 lenses. The rear of the camera is flooded with buttons, but the rubber grip wraps around to the back to provide a gripping area for your thumb. I do wish the landing area for the thumb was more sculpted, as there is no real tactile ‘place’ for your thumb…something like the Olympus OM-D E-M5’s rear thumb rest or the GX1’s thumb pad would be welcome here. Still, the camera feels great in the hand. The GX7 comes in a two toned black and silver body, and an all-black version. The styling looks similar in many ways to the styling used on some other mirrorless cameras…notably the Fuji X-E1 and the Olympus E-P5, though Panasonic’s version is a little more modern in design. The camera is clad in a well-finished painted aluminum and the build quality is rock solid, with absolutely no creaks or flexing whatsoever. 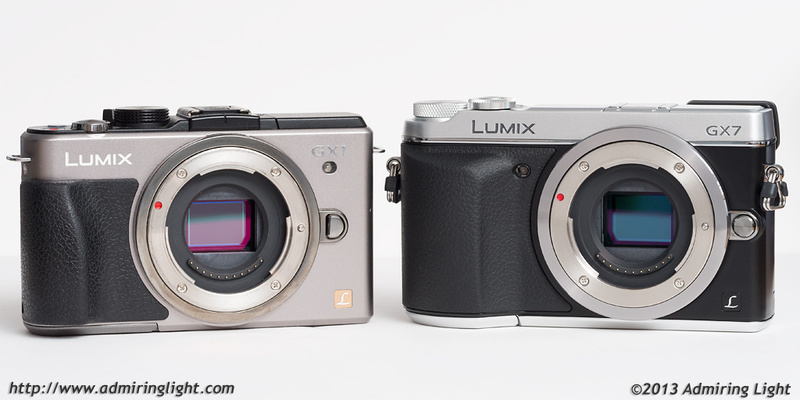 The Two Members of Panasonic’s GX line: The GX1 and GX7 – the GX7 adds a viewfinder and chunkier grip, making the overall package a bit larger than the original GX1. The front two metal dials on top are finished beautifully and have very positive clicks. The mode dial has plenty of resistance, so you won’t accidentally knock the dial out of position, even though your finger arches over the mode dial to get to the shutter button. The shutter button looks like it may be poorly positioned when you first look at the GX7, but in practice it sits naturally under your finger. The dial surrounding it, though, is slightly harder to actuate due to the angle at which your finger approaches. This is a minor thing, though, and I was still easily able to change settings when desired. The top of the camera also houses the built-in pop-up flash that can be manually tilted to provide some bounce flash, as well as a standard ISO hotshoe for external flash use. Next to the hotshoe sits the camera’s breakout feature: the tilting viewfinder. 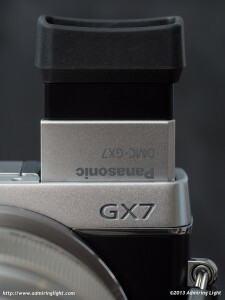 The most notable addition to the GX7 is the inclusion of a unique tilting corner Electronic Viewfinder (EVF). The GX7’s EVF protrudes slightly to the rear, but can be articulated at any angle up to 90 degrees, allowing for easier composition of low angle shots. The EVF in the GX7 is the best ever on a Panasonic body. The optics are notably clearer than those used in the GH3, and the high resolution 2.76 million dot finder is clear and crisp, with good contrast and color. It provides a relatively large view, though not among the largest, and a little smaller than earlier Panasonic viewfinders (though much higher resolution). Part of the reason for this is that it’s a 16:9 aspect ratio viewfinder, and while the 16:9 view when shooting video is utterly gorgeous (and very large), when shooting stills, the viewfinder is pillarboxed and smaller as a result. In my review of the Panasonic GH3, I noted that this pillarboxing of the viewfinder was distracting and made me feel disconnected to the scene. While this was true on the GH3, the GX7 doesn’t suffer the same fate. 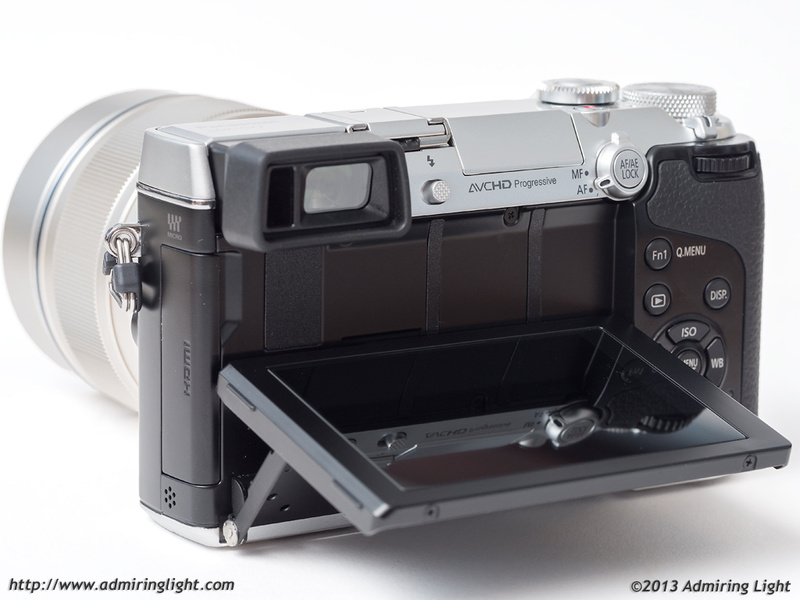 Since the viewfinder in the GX7 has such nice rich blacks, the pillarboxes don’t distract like they did on the GH3. The EVF features a very high refresh rate, and while it does slow down a bit in dim light, the lag doesn’t pose a problem for getting the shot. Noise is also well controlled in the EVF in low light. Overall, it’s an excellent finder, and probably the second-best EVF I’ve used, next to the utterly spectacular Olympus VF-4. The rear screen on the GX7 a 3″ tilting LCD with 1.04 million dots. It’s an outstanding rear screen, with capacitive touch and crystal clear images. The screen has great color and contrast and is an excellent tool for composing and reviewing images. I believe the GX-7 has a high burst rate of 10 fps, and a super high (with decreased resolution) of 40 fps. I agree about the rear thumb wheel, they should have milled it like the front one, My G2 rear wheel is impossible to use in cold weather or with gloves. Wear fingerless gloves. That’s what I do with my GH2. Works great. and what do you do when your fiingertips get cold? I find a nearby cafe and order some food and a nice big Belgium beer. I had mentioned the super high 40 fps, but the 5 fps is the limit with the mechanical shutter. You can shoot in full resolution at 10fps with the electronic shutter, but there is real potential when shooting fast action with the electronic shutter to have very odd distortion artifacts from the sensor read out, which makes it less useful than full speed with a mechanical shutter. I have updated the review to better clarify this. very nice thought out review Jordan! The photos do appear to have nice warm colours to them. Do you use Lightroom to process the RAW files and use standard Adobe profiles? I read this somewhere and was curious to hear from you – does the noise appear to be bit more film like ( grain) than the EM5 /EP5? All the posted images were processed in Lightroom 5.2 with the standard Adobe Profile. I could create a custom profile, though since that requires a separate product, I review new products with what’s available to the average user. (Well, Lightroom is a separate product as well, but most shooters who will shoot RAW will own one of the big RAW converters). You can look at the noise sample provided in the Noise section at full size (click on the image, then click the green arrow at the bottom of the screen to go to 100%), which shows 100% crops of the GX7 and the E-M5 side by side at all ISOs. I personally find them to have very similar noise profiles, just that the GX7 has very slightly more noise except at 25,600 where it’s a little better. In any case, the output from these cameras is extremely close. Um, because that’s how the cameras work? Don’t trust me, look at the crops for yourself. These were tripod mounted with the same lens (25/1.4) at the exact same settings (ISO, aperture, shutter speed), taken less than 3 minutes apart. Thanks for he great review. I have one question: did you test IBIS with non-OIS lenses? The GX7-IBIS does not work with OIS-lenses. I’ve seen other reviews that find the IBIS to be very effective..
Good review…but I have a question…I am reading some other side-by-side reviews on the web and am seeing a different conclusion than what you have arrived at regarding the still-image is. You go out of your way to say how superior that the 5-axis IS is in the EM5 and you site that IBIS as the primary reason that you will maintain using the EM5 As your go to camera.. For still images surprisingly the IBIS in the EM5 would appear to have no advantage over the GX7, (Of course the EM5 has the IS advantage in video mode as the GX7 has no IS in video mode). I am an EM5 owner myself and surprised at these findings, too. Perhaps if you did a side-by-side test you may be surprised. I had done comparisons side by side with my E-M5. For instance, I tested the 25/1.4 on both cameras indoors. The GX7 was consistent down to about 1/30s. Below that, it was all over the place. Sometimes I was sharp at 1/5 sec, sometimes I was blurry at 1/20s. The E-M5 was consistently sharp at 1/5 sec. The biggest issue I had with the GX7’s IS was that I couldn’t trust it to get the shot at a certain speed. It would do fine sometimes 3 stops slower…but not all the time, which made it much less useful for me. You may be different, but I need to have faith in my gear that it will perform how I expect, when I need it. On the GX7, that meant trusting the IS to no slower than 1 stop below normal handholding speeds. It can do better…just not all the time. If you read a bunch of reviews, you’ll see the results from the IS are all over the place. CameraLabs had a similar experience to mine, while there was a different recent review that had better results with the GX7 than with the E-M1. I think a lot of it may come down to how each individual photographer manifests their hand shake. If one photographer moves almost entirely along the 2 axes that the GX7 corrects, they may have superior results. I likely have a more 3 dimensional shake pattern, which the OM-D corrects beautifully, but the GX7 doesn’t (though I don’t have issues with OIS lenses – the 35-100/2.8 and the Fuji 55-200 are both very solid with their OIS in my hands – but I did have similar results to the GX7 with the 2-axis Olympus Pens). I tested the IS with the Olympus 9-18, the 25/1.4, the 75/1.8 and the Canon FD 85mm f/1.8. The 35-100, of course, used its OIS when mounted. Did you notice any shutter shock with the GX7? Not that I could pinpoint directly as shutter shock. Can anybody advise me if GX7 is better for young lady than Canon Rebel SL1? GX7 is deffinately better for any lady and any gentleman, IMHO! If you have any specific requirement though, we may discuss here, otherwise, I can’t see a reason to chose any Canon cropped sensor camera over GX7! It’s so fine and stylish review… Let me ask a couple of questions. I enrolled into a preliminary record to buy this camera in few closest weeks as soon as it would be available in my country. but I don’t expect to discover something wrong because I do trust in Panasonic, I was the owner of Panny GF1, G2 and G5 and generally I can imagine what I should get . I hate to see a jerky, flickering or moire patterns in EVF, it’s rather critical for me. Could you kindly comment if you noticed something similar looking via GX7 EVF? And else, whether it’s a real handicap that the 4:3 viewfinder mode is small because it’s actually a crop of the native 16:9 picture? Did you feel any visual discomfort due to this not so conventional EVF design? Bummer you didn’t include ISO info in your sample shots so we could draw our own conclusions. Hopefully you’ll add that. Thanks for the review and beautiful sample photos. Quick question: I notice my GX1 (and GF1 before that) underexpose heavily at higher ISOs. Usually, I have to use up to +2 ev compensation to get properly exposed photos at 3200 – 6400. Does the GX7 do this as well? Can anyone offer any thoughts on the GX7’s EVF? I am very tempted to buy one, I already have a GF1. However the 16/9 viewfinder format surprise me somewhat as most snapper would be using 4×3 or 3×2. Is using 4/3 or 3/2 practical in a 16/9 finder? Or is the image too small? Excellent review, thanks! Just one query, at the top of page two you state the movie button can be “commandeered for additional functions as well”. I would love to be able to set this to quickly shift ISO while keeping my eye to the viewfinder, but i can’t see where to set this! Any ideas? Your information about the Flash auto exposure compensation has made my flash usable! Many grateful thanks. Helped me too – today Aug 22, 2016! You say that the facility to enter the focal length of lenses with no electrical contacts is the first of its kind. Every Pentax DSLR has had that option from the beginning, the ability to use legacy K-mount lenses being one of the attractions of their line. That said, your review of the GX7 is very fair. I’ve had one for over a year and it reflects my experience. Including the relative ineffectiveness of the in-body stabilisation.